I think you’d be hard-pressed to find someone who would turn their nose up to some good ol’ homemade meatballs (unless they’re a vegetarian, of course!). We LOVE meatballs at my house, including everything from Moroccan style to Swedish to Italian (below). 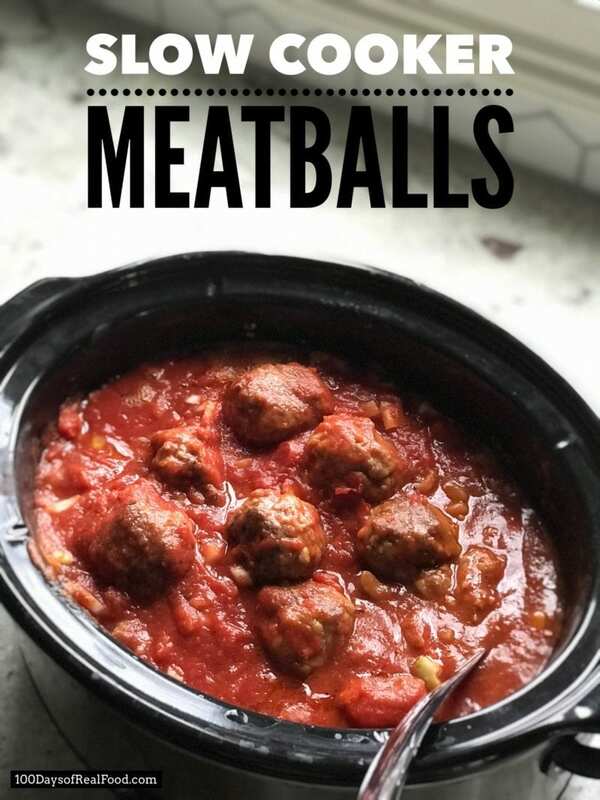 And my favorite part about this meatball recipe is that, in addition to getting all the work done in advance thanks to your slow cooker, the sauce includes veggies to help make this a “better-for-you” recipe. It’s fabulous served over whole-grain noodles or polenta (and topped with more veggies if you’re so inclined)! I do say this serves 10, but it’s really more like 8 in my family these days. My kids are hungry little rascals and some of you are noticing on social media. When I used to post my kids lunches on Instagram and Facebook, back when they were in elementary school, many commenters would say, “Wow, that looks like a small snack for my son” (who, come to find out, was a football playing highschooler). And lately, I’ve been chuckling to myself about how many people comment and say my kids’ lunches look like A LOT of food, way more than their kid could ever eat. Sometimes things just come full circle! Both my girls are in middle school now, are almost as tall as me, and are pretty active (including one who does 12 hours/week of gymnastics and loves every minute of it!!). So, things have changed around here and, back to those comments, each child’s appetite is and should be different depending on their age/size/activities and interest in food. These days I can hardly keep enough prepared food in the house with the hunger that’s going on so, while this should serve 8, we just aren’t in that stage at the moment and that’s okay. I’m usually doubling recipes anyway to give us even a chance of leftovers—which my husband and I love for lunch! With this recipe being on the larger size, I can just make it as is and hope for a respectable amount left the next day. If you’re feeding a smaller group, or those with smaller appetites, the finished meatballs and sauce do freeze beautifully, so keep that in mind if you want to save it for a rainy day! Enjoy. Put all the ingredients, except for the flour, in a large bowl and mix with your hands until thoroughly combined. Form into 1 1/2 to 2" meatballs, roll around in the flour until coated, and set aside. Heat 2 tablespoons of oil in your largest skillet over medium-high heat. Shake the excess flour off the meatballs and cook until brown on all sides. Cook in batches, if necessary, and drizzle in extra oil if pan starts to appear dry. Transfer to bottom of the slow cooker. Place the onion and veggies on top of the meatballs and follow with the seasonings and tomatoes. Cook on high for 5 to 6 hours. Spoon off (and discard) any cooking fat that has collected at the top of the sauce and serve over whole-grain pasta or polenta. Looks delicious by why the flour? Does it help them stick together? I’ve never seen that done before. Thanks for sharing all your tricks and recipes! This looks and sounds delicious! We don’t eat gluten. What can I easily substitute the flour and breadcrumbs for? You could skip the flour and sub gluten-free breadcrumbs (easy to make using gluten-free bread: https://www.100daysofrealfood.com/recipe-homemade-breadcrumbs/). 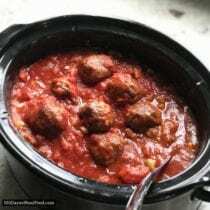 Do you think I could make the sauce in a Dutch oven, then add browned meatballs and simmer in order to make in less time? I feel you, Stephanie! I often add shredded carrot and zucchini to my red sauce; somehow the shreds are less “noticeable” to the veggie-averse members of the family. When I make meatballs, I bake them in the oven to brown them before adding to sauce. Usually about 8-10 min on 350. I have a GF one in my house so I’m going to try these meatballs w/ GF breadcrumbs and baking to see how they turn out before putting them in the crockpot. These were delicious. Made them in the oven instead…baked meatballs and veggies for 30 min at 350 then added tomatoes…baked another 30 min then turned oven down to 300 for another hour (til we were ready to eat). Will definitely make again! I already make your Swedish meatballs regularly so glad to have another great meatball recipe! !